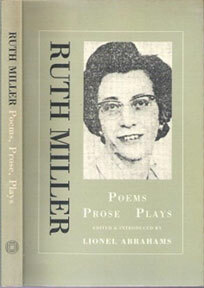 Ruth Miller was a South African poet born in Uitenhage in 1919, spending her adult life in Johannesburg. She was schooled in a Catholic convent in Pietersburg and her occupations included school secretary and later an unqualified English teacher at St Mary’s school. Not much is known of her private and domestic life. Miller wrote short stories and plays but is best known for some of the most vivid and moving poems in South African literature. Her first volume, Floating Islands was published in 1965, just 4 years preceding her death. This collection was awarded the Ingrid Jonker Prize. A second collection Selected Poems, was published in 1968 as part of the Phoenix Living Poets series. After her death in 1969 from breast cancer, a selection of her work was published in 1990 in Poems, Prose, Plays, edited by Lionel Abrahams. She was only 50 years of age. The Phoenix Living Poets series has an interesting history. It was a series of slim poetry collections published between 1960 and 1983 by Chatto and Windus Ltd, originating in Hogarth Press, which was founded in 1917 by Leonard and Virginia Woolf. In 1946, Hogarth came under the control of Chatto and Windus and in 1969 Chatto and Windus joined Jonathan Cape, becoming part of Random House in 1987. Poets included in the series were seen to be those offering a significant range of voice and style. A typical volume had between 48 – 72 pages. Many of the covers were designed by Enid Marx, known for her patterned textile and book jacket designs. Other poets featured in the series include James Merrill, Adrienne Rich and Anne Sexton. Ruth Miller was a woman writing in a society dominated by patriarchal authority. Her writing reflects the existential crisis generated by her simultaneous compliance with and denial of the patriarchal system within she lived (Salkinder, ii). In voicing her dissent of the system, she was an iconoclast of her time. Her poetry is abundant in religious motifs and metaphors. Lionel Abrahams in his introduction to her collection describes her as a “humanistic liberal, and in her religious outlook, essentially an ironic agnostic” (1990: 15). This agnosticism was compounded by the tragic death of her son who was electrocuted at the age of fourteen. His death propelled her into a crisis of faith. Michael Chapman describes her as “self-assertively modernist” (1984: 131). She engaged with the voices of her literary forefathers – Shakespeare, Milton, Hopkins, Frost, Yeats and Auden (Salkinder: 60). Much of her poetic vision addresses the potential of religion to generate a meaning that corresponded to her belief system. The failure of divinity to do so, is a thematic element that binds many of her poems. One of the strengths of Miller’s poems is their ability to simultaneously convey yearning and grief, compassion and delight. The haunting, imaginative world of Ruth Miller should be explored and remembered by all South Africans interested in the world of poetry. Abrahams, L. Ed. 1990. 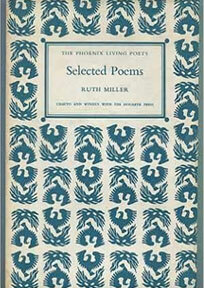 Ruth Miller: Poems, Prose, Plays. Cape Town. Carrefour Press. Chapman, M. 1984. South African English Poetry: A modern perspective. Cape Town: AD Donker (Pty) Ltd.
Chapman, M. 1990. Ruth Miller: Breaking Silences? English Academy Review. 7(1): 13-23. Accessed 3 December 2016. Salkinder, M. A. 2002, The poetry of Ruth Miller: the Word and her words. Available at www.open.uct.ac.za/handle/11427/13936. Accessed 5 December 2016.